A minor change to the Dahon Boardwalk. After using the previous OTA seatpost for more than 2 years, I felt that it was time to change to a new seatpost! Although a seatpost does not wear out like a moving part (such as a cassette or chain), it does get some scratches along the way. There was also an annoying creaking sound coming from the seatpost area, and I could not isolate the problem to solve it. Even after checking the saddle clamp and seatpost clamp, the sound would still appear intermittently. Because of these reasons, I decided to try out a new seatpost. Came across a new brand of seatpost for Dahon / Tern bikes. 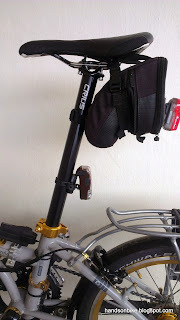 This brand, called Crius, is a brand of folding bikes modeled after Dahon. In fact, they make bikes that are so similar to Dahon, that they have practically interchangeable parts. Not sure about the quality compared to Dahon, but they do sell frames individually, unlike Dahon which (officially) only sells complete bikes. This means that you can get a Dahon-like frame from Crius, and build up your own folding bike, using similar parts from Dahon / Fnhon / Crius. 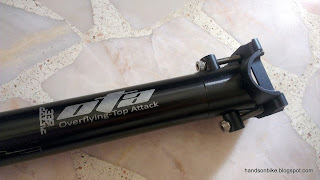 Why didn't I choose the more popular (and lighter) LitePro seatpost? This is because of the new LitePro saddle rail clamp design, which is not a good design at all. 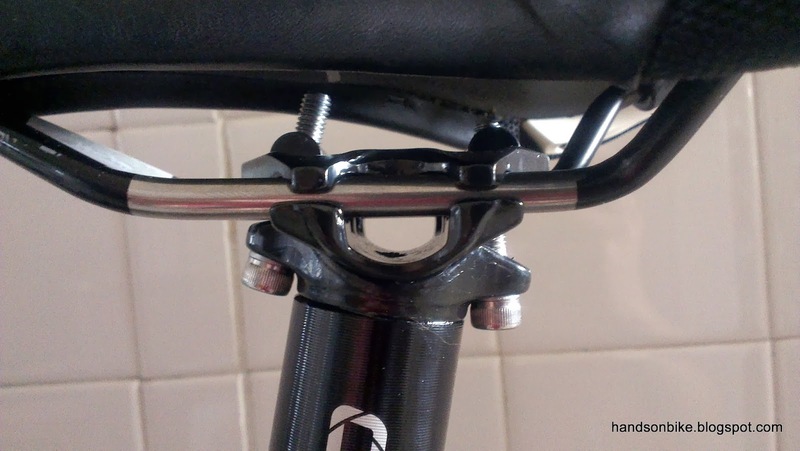 As you can see from the picture below, the 2 clamps cannot rest flat on top of the saddle rails, due to the clamping angle being limited by the angle of the 2 bolts. In fact, the bolt on the right looks a little bent! The end result is that only the 2 edges of the clamps will be holding on to the saddle rails. 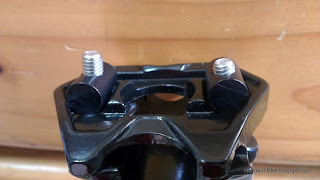 Saddle rail clamp design used by most 33.9mm seatpost manufacturers, such as OTA, LitePro, TAT, and KCNC. The cause of this is due to the omission of two cylindrical nuts on the clamps, for the purpose of saving weight and cost. Without these cylindrical nuts, the clamps cannot rotate to align and rest nicely on the saddle rails. I am disappointed to see that for the purpose of saving weight, the new design seems to have compromised on the strength and durability of the saddle rail clamps. The old OTA seatpost which has served me faithfully. It has the older but better saddle rail clamp design. 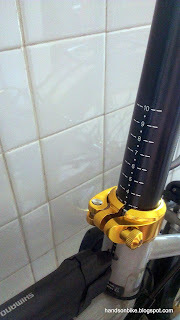 Saddle rail clamp design on the old OTA seatpost. 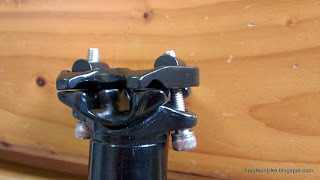 The 2 cylindrical nuts on top allow the clamp to rest flat on the saddle rails, independent on the angle of the bolts. Note that the clamp is also one-piece for greater stability, instead of being split into two pieces in the new design. If you can read Chinese, you can check out the original article here to get a more detailed account of the saddle rail clamp design. It is actually quite difficult to find an aftermarket folding bike 33.9mm seatpost that does not use the new clamp design. As I did not want to use a seatpost with the new clamp design, this means that the common brands of OTA, LitePro, TAT, KCNC, etc are out. 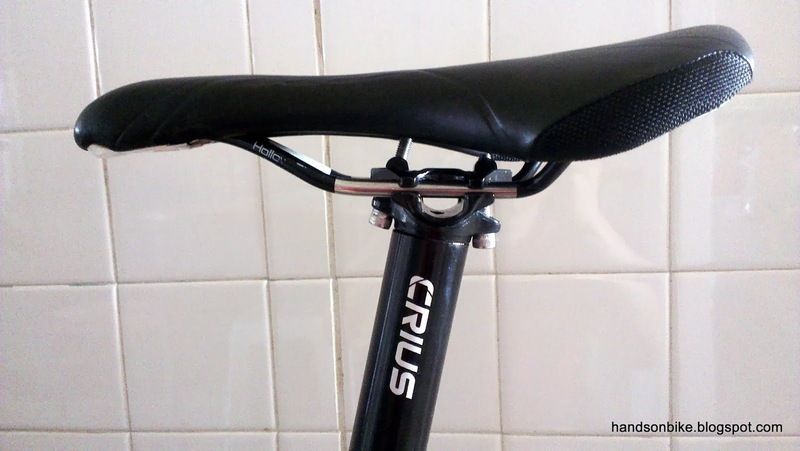 After much research, I found this Crius seatpost which satisfies my requirements. 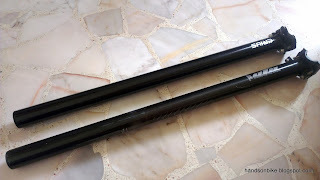 Without any further delay, let us take a look at the Crius seatpost. First thing I did was to weigh it! 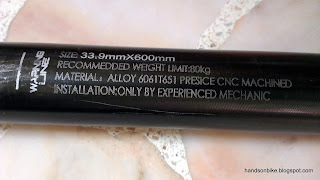 It is quite a bit heavier than LitePro or OTA seatposts (330-350grams), at 416 grams. 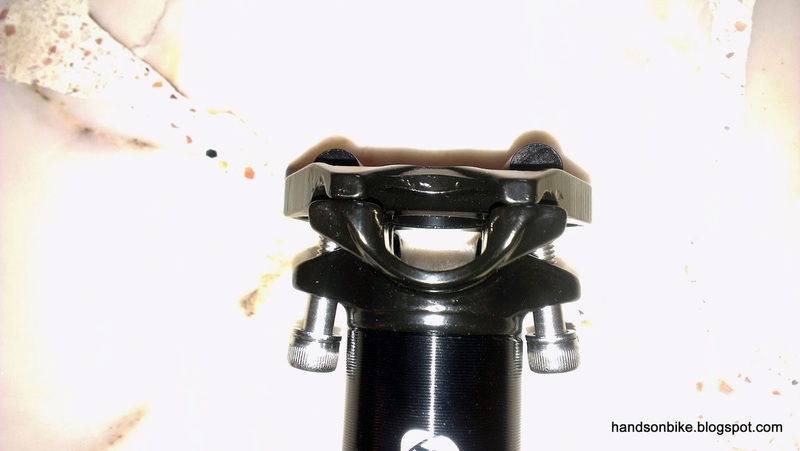 From my brief observation, the reason for the heavier weight is mainly due to the beefier saddle rail clamp. Let's take a look at how it is different from other clamp designs. The two cylindrical nuts allow the clamp to rest flat on the saddle rails for maximum stability and strength. 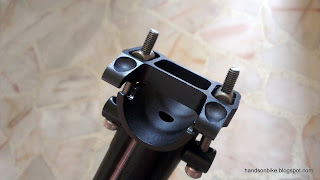 The two bolts are actually larger and stronger M6 bolts, instead of the narrower M5 bolts used on other LitePro or OTA seatposts. 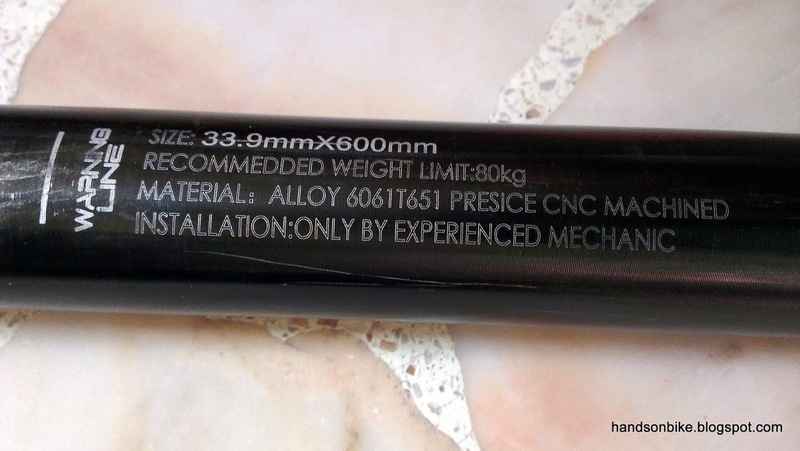 All the parts of the seatpost are made of aluminium, except for the two steel bolts. 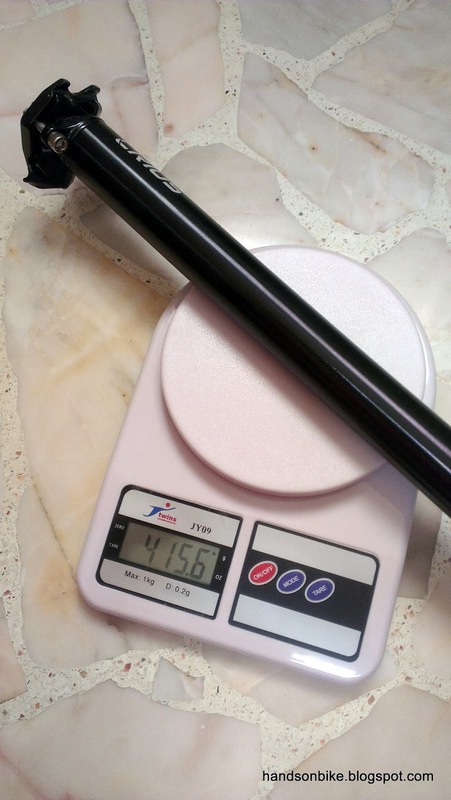 Other differences between the old OTA seatpost and the new Crius seatpost is the length and the stated weight limit. New Crius seatpost is slightly shorter at 580mm. The stated weight limit of 105 kg is higher than LitePro or OTA, which is good for heavier riders. Not sure if this higher weight limit is due to the shorter seatpost length, or a stronger tubing design? 580mm vs 600mm length. Does not affect me as I don't need such a long seatpost anyway. 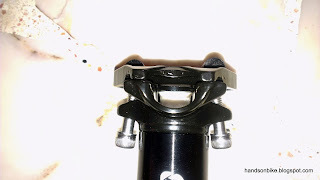 The clamp design is not tilted by default to one side like the ones on some LitePro or OTA seatposts, which means that I am free to use either side of the seatpost as the front side. 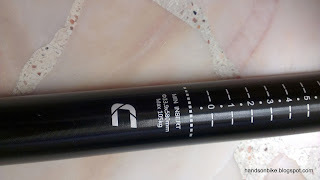 New Crius seatpost, set up such that the height markings are located at the front, instead of at the rear. To me, having the height markings at the front is much more useful as I can check the height and the angle of the saddle easily. 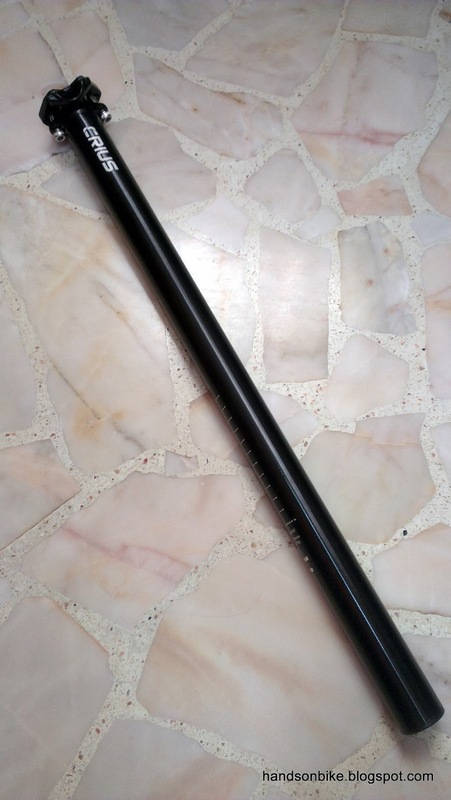 In fact, I have never used the height marking on the previous OTA seatpost as it is located at the rear of the seatpost, which is not helpful at all. Installing the saddle onto the seatpost. No problem here. Saddle rail clamp is able to rest flat on the saddle rails, regardless of the angle of the bolts. Riding with the new seatpost feels very similar to the old one, apart from the fact that the new seatpost seems more rigid. Not sure if it is actually more rigid, or it is just my own imagination. In any case, the creaking sound has gone away! Although the Crius seatpost is heavier than LitePro or OTA seatposts, the +25kg weight limit is good for riders close to or above 80 kg. At around 416 grams, it is still lighter than the stock D7 seatpost of about 590 grams. I am also in favour of the larger and stronger clamp bolts, and the stronger clamp design. Although I am not close to hitting the weight limit (I weigh 60+), it is always good to have a stronger seatpost for more margin against failure. If you are currently using LitePro or OTA seatposts with the new saddle rail clamp design, do take a look at the clamp and see if it is clamping properly. If the clamp is able to rest flat on the saddle rails, then it should be OK. 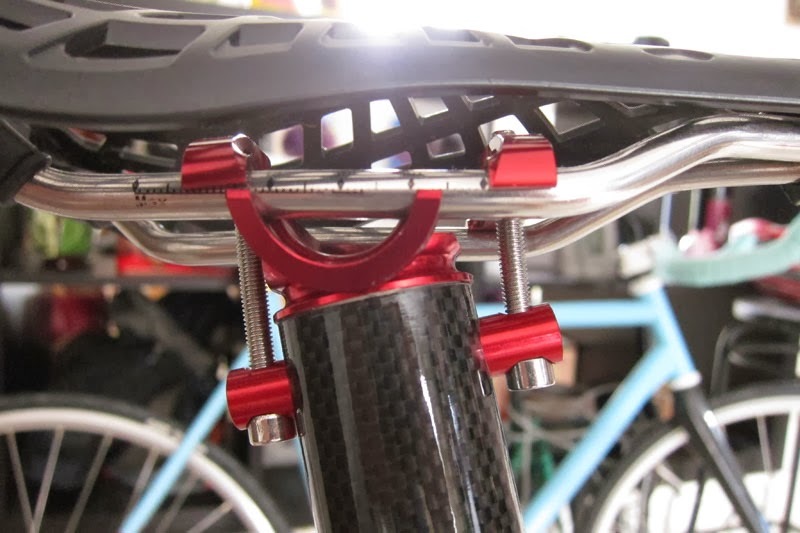 However, if the 2 clamps on top are tilted, or if the bolts are bent, then it may be a good idea to adjust your saddle angle, or change to a seatpost with a better clamp design. Sztyca wygląda genialnie, czy ktoś zna cenę tej sztycy do siodełka, gdzie ją można kupić w Polsce? Proszę o informację. HI I translated your message from Polish to English, and I understand that you are asking about the price and where to buy it. This seatpost is from Taobao.com, which is a China website. Might be difficult for you to navigate and buy it. You can actually check out www.premiumbikegear.com for Tern seatposts, which are similar in design, but more expensive. Gdzie można kupić taką sztycę do siodła w Polsce i ile ona kosztuje? Does Crius have a website? Google suggested www.criusbike.com, but that doesn't seem to work. Thanks for your help! Their items can be found mostly on Taobao.com. Think it is mainly a China domestic brand. Hi Steve! thanks for the informative site and postings! I own a Dahon Mu SL, which comes with a kore i-beam seatpost, and am looking for alternatives so that i can use the regular saddles. I am trying to get this Crius via taobao, but want to ask - are there any other options that you have came across, especially available in a LBS in SG? The OTA and litepro have a weight limit of 80 kg, which ruled them out for me. I would suggest getting the stock seat post for Dahon or Tern. They are really strong and cheap. 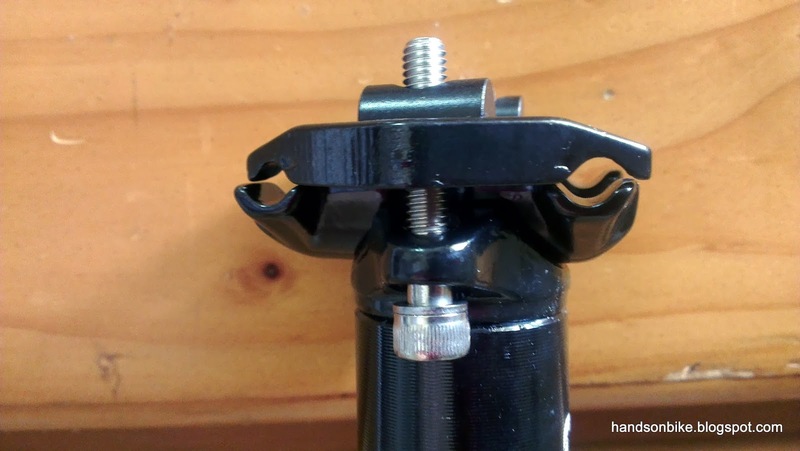 An alternative would be to get a syntace seatpost from premiumbikegear.com. The seatpost pump version is too heavy. will also go check out the syntace although the pricing is a bit higher than what i am looking for. Yes these are the stock ones that are strong and cheap, although a little heavier. I am using both the yokes and the shim on all my bikes and I REALLY like them. 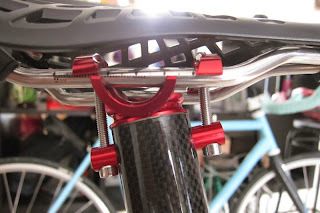 I find that this shim adds a lot of grip when using either an aluminum or carbon fiber seatpost. This is just a suggestion. Keep up the great work! I have used the plastic shims before, but found that they are too slippery to hold the seatpost firmly. 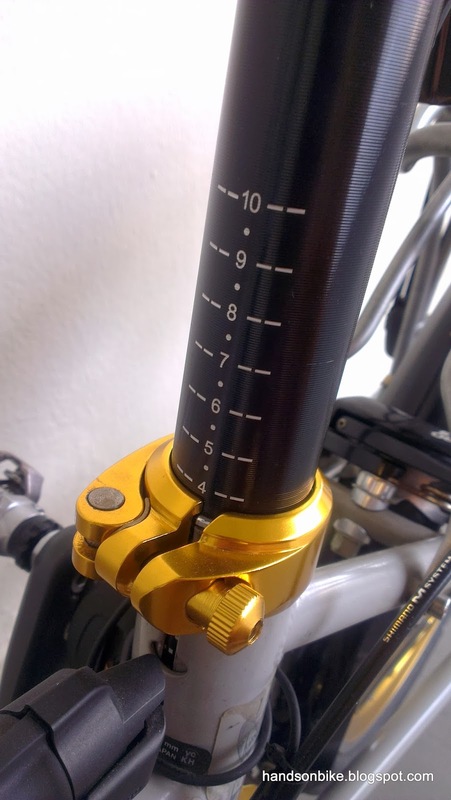 The seatpost will tend to rotate even after clamping time tightly. In the end I went back to using the metal shims for more grip. Hi Steve, I'm not able to find the Crius seat posts on Taobao. The listings all show full bikes. Any idea where else I'm able to find the seat post? Thank you!! Don't think the shorter 20mm will have any impact, as long as the minimum insertion length is met. The Crius seatpost weight limit is stated to be 105kg (not sure how much it has been tested though). what's the taobao link to the crius seatpost? found 1 seller but the stats stated 0 sale, hoping to find a reliable seller. It was quite sometime ago so I can't find the link I used anymore. Seems that this seatpost is not easily available now. 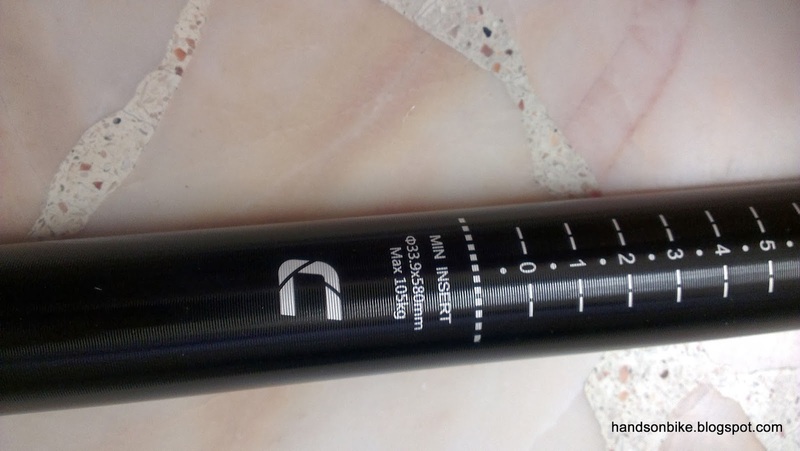 You can try this Litepro seatpost which seems like a rebranded Crius seatpost. It should be the same, as Crius is part of Litepro. it's not, the weight limit is only 80kg for litepro. im looking for those >80kg.